Well, that rumor didn't last all that long. We first heard the rumors about 11 days ago that Google could be opening its own retail stores this holiday season. Exactly one week ago, the Wall Street Journal "confirmed" the rumor, and now Android head Andy Rubin has smashed the rumor, saying that "Google has no plans" to open retail stores. Rubin said that he ultimately thought that customers "don’t have to go in the store and feel it anymore" when purchasing a device. Given the comments earlier from Jamie Rosenberg confirming Google's support of selling devices through the Play Store, these comments from Rubin don't seem that out of place. Of course, saying that Google doesn't have plans for retail stores doesn't discount the possibility of more pop-up stores and stores-within-stores for the holiday season. We'll have to see on that. 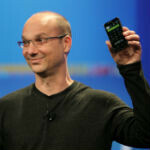 After the Nexus One Google Execs swore up and down that there would not be a Nexus Two. Then a while later out comes the Nexus S. Sure, it wasn't called the Nexus 2, but in reality that's exactly what it was. So while I believe what he's saying about no stores at the moment, the idea has probably been explored and I wouldn't completely dismiss the possibility of this happening in the next year or two. Did you hear that? ...my heart just shattered. B*stards. But does Google really need a retail store? Think about it...Apple had to create a retail experience because everyone was so used to Windows. Most folks wouldn't buy a Mac simply because they had no clue how to use or that things they do on their PC translated to the Mac without any problem. Google doesn't really have that problem. Apple made the smartphone for everyone and got rid of the learning curve. Google has continued that to the point where people can indeed shop for phones and tablets online without having it in their hands. If they DO want to touch and feel it, there are other outlets (carrier or electronic stores) that they can visit. Seems like a good idea to me. And I still think a big problem with Google having their own store is having to support the hardware and layers of Android provided by the manufacturers. That, alone, would be a huge headache.